Starting in Warsaw Sep 8, 2019 - one date only! Land tour starts in Warsaw on Sep 8 at the hotel and ends in Krakow on Sep 18 at the hotel. If arrival / departure times do not coincide with rest of the group, transfers to / from airport may be arranged at additional cost. Meals: buffet breakfast daily at hotel, 3 lunches, 7 dinners plus Vodka Tasting , Cordial Sampling and Wine tasting events as per tour itinerary. Hotels: All rooms with private bath or shower, based on two person sharing a room. A limited number of single rooms are available at a supplement . Chopin Tours reserves the right to substitute hotels of similar category, when and if necessary. We are a small group of friends and fellow travelers who have enjoyed traveling together since 2004. Our tours have acquired an enviable reputation for providing unique travel offerings, outstanding quality and first-class dining and entertainment activities. Now that Poland is experiencing strong economic growth and relative prosperity, Poles are rediscovering their splendid cuisine and the Polish food scene now boasts many exciting new restaurants, cafes and artisan food companies. This is particularly true of the main Polish cities, including Warsaw and Kraków which offer the tourist wonderful cultural attractions as well as memorable dining options. In fact, with over 26 Michelin rated restaurants, Kraków has recently been chosen as the Culinary Capital of Europe for 2019 by the European Gastronomic Academy. So, for 2019, in addition to our usual cultural excursions we are also adding a few of these touches, including some cooking demonstrations, samplings and tasting events. We'll see how Polish vodka is made (and tastes!) at the newly opened Museum of Vodka in Warsaw, sample regional Polish artisan cordials in Kazimierz Dolny, experience the legendary "Piwo Lwowskie" beer in Lwów and be treated to a private tasting of Polish wines and regional cheeses in Kraków. 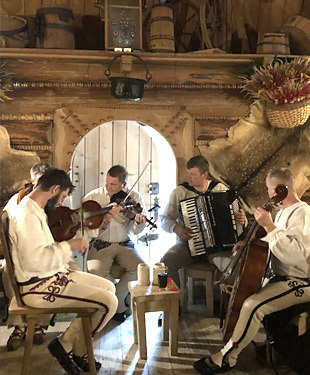 We will also enjoy traditional Polish food and entertainment in Zakopane, complete with lively Polish mountain music and song. Arrive Warsaw and transfer to hotel. Welcome dinner at one of Warsaw's top restaurants. Overnight in Warsaw. Panoramic city tour of Poland's dynamic capital, lovingly rebuilt from near total destruction during WWII. Tour includes the Warsaw Uprising Monument, Tomb of Unknown Soldier, Palace of Culture & Science, Lazienki Park, the historic Old Town and tour of the Royal Castle. This evening we will enjoy a special group dinner. Overnight in Warsaw. Today we will explore some of Warsaw's culinary delicacies including lunch in the trendy Praga District. We will also learn about Poland's age-old vodka tradition with a tour and vodka sampling at the newly opened Museum of Polish Vodka. The late afternoon will include an optional visit to Wilanow Palace built for King John III Sobieski in the last quarter of the 17th century and one of Poland's most important architectural monuments. You may also prefer spending time shopping, relaxing or visiting the wide-range of museums in the Polish capital, including the National Museum, the POLIN Museum, Chopin Museum or the 1944 Warsaw Uprising Museum. Overnight in Warsaw. We travel to the quaint artist colony of Kazimierz Dolny, established by Casimir the Great in the 1300s. Time for lunch and strolling the colorful streets and browse the many galleries selling folk art and fine art. 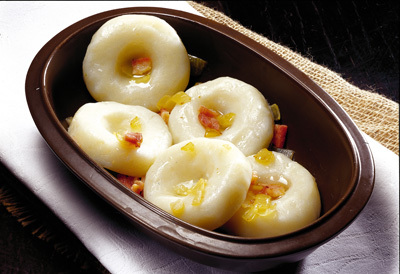 We will also be treated to a sampling of traditional Polish nalewki (cordials) and sample baked koguty, rooster-shaped rolls which are a culinary tradition of Kazimierz Dolny. 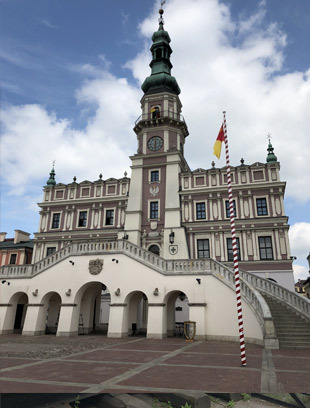 We continue to Zamosc, a UNESCO World Heritage Site built in 1540 by Count Jan Zamoyski and considered the most perfect example of Renaissance urban architecture in northern Europe. We will enjoy dinner in one of the historic buildings lining the Market Square. Overnight in Zamosc. After a morning walking tour of Zamosc, we depart for Lwow (Lviv), just across the Ukrainian border. Prior to entering the city, we will enjoy a hearty lunch at the Golodny Mykola, specializing in the cuisine of the Galicja region. While in Lwow, we will be staying at the stately Hotel Leopolis. After checking in to the hotel, the rest of the day will be at your leisure. 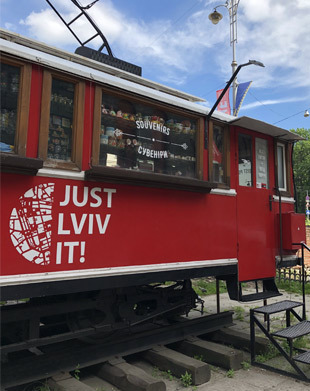 A visit to the Lvivarnya Brewery Museum to start exploring the history of Lwow through its brewing heritage as well as a tasting of the local artisan beers produced here can be arranged, please let us know if you are interested. Today we will become acquainted with beautiful Lwow, formerly a major Polish historic and cultural center. Our guided tour will include the Market Square, the Grand Opera House, the Adam Mickiewicz Monument, the Armenian Cathedral with its impressive murals by Jan de Rosen and the Roman Catholic Cathedral which witnessed many significant events in Polish history, including the proclamation in 1656 by King Jan Kazimierz declaring the Virgin Mary as Queen of Poland. Lwow is famous for its coffee houses, so this afternoon you will have free time for shopping, or to enjoy a coffee, pastry or snack at one of the many cafés and restaurants in Old Town, such as Lviv Chocolate Factory or Kopalnia Kava where they "mine" the coffee beans in the basement "coffee mine." This evening we will be treated to a "Lwowski Wieczor" - an evening of old-fashioned Lwów hospitality and entertainment that was typical of the city prior to WWII. Overnight in Lwow. This morning our tour will take us to the remarkable Lychakiv Cemetery, created in 1787 as Lyczakowski Cemetery, which has been the main necropolis of the city's most prominent citizens. A section of the cemetery is known as The Cemetery of the Defenders of Lwow the "Orleta Lwowskie" (the Eaglets) a term of affection applied to the Polish teenagers who, along with several American volunteers fought and died defending the city during the conflicts with Ukrainian insurgents and the Bolshevik Red Army between 1918−1920. From here we depart Lwow and drive back to Poland arriving in Rzeszow for dinner and overnight. Breakfast and option to attend Sunday Mass. Leaving Rzeszow mid-morning we take a short drive to Lancut Castle, one of the most beautiful aristocratic residences in Poland, famous for its excellently preserved interiors and unique collection of horse-drawn carriages. After our tour of the Castle and lunch, we will continue to Krakow and check into the Andels Hotel, which is conveniently located near Krakow's picturesque Old Town. As Poland is becoming increasingly recognized for its wine production, we invite you to attend a Tasting Event in the early evening featuring Polish wines and local cheese. Afterwards, you are free to explore Krakow's many fine restaurants for dinner on your own. Please feel free to ask us for recommendations. Overnight in Krakow. Today we drive south to Zakopane. This popular highlander resort town draws visitors year-round, in the winter for skiing and the rest of the year it is a hiker's paradise. Zakopane is known for its wooden architecture and you will see many examples as we take a drive around Zakopane on a short tour stopping in to visit the village of Chocholow and the quaint wooden chapel at Jaszczurowka. We will take the funicular(cable-car) to the top of Gubalowka Hill for spectacular views of the Tatra mountains (weather permitting). Later stroll the colorful market place - a great opportunity to pick up unique gifts and souvenirs. Tonight we will enjoy dinner at local Inn with highlander music and folklore before returning to Krakow. Overnight in Krakow. 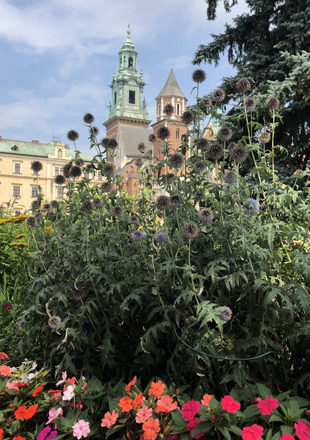 A walking tour of Krakow this morning will include Florian’s Gate, the Barbican, Royal Wawel Hill, and the Old Town area with its Market Square, the Cloth Hall, and St. Mary's Church. The rest of the afternoon is at your leisure to enjoy all of what Krakow has to offer. Spend time shopping for folk art and souvenirs in the historic Sukiennice with its dozens of vendor stalls dating back to the Middle Ages, or visit the National Gallery with its fine collection of 19th century Polish paintings or enjoy the rooftop café overlooking the main Market Square. You might also opt to people watch at one of Old Town's many charming cafes. Optional activities today include a tour of the historic Wieliczka Salt Mine, Schindler's Factory, or try your hand making your own delicious confections at our special Chocolate Making Workshop at the Krakow Chocolate Factory, located in Old Town! Our culinary and cultural visit to Poland will conclude with a memorable group dinner at Szara Ges Restaurant, one of Krakow's leading gastronomic experiences. Overnight in Krakow. After breakfast transfer to the airport on Krakow - or extend your stay in Poland. email directly to your Inbox. 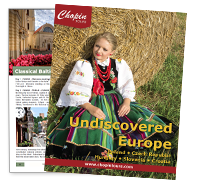 Copyright ©2015 Chopin Express Tours, a Division of Polimex Travel Inc., All Rights Reserved.